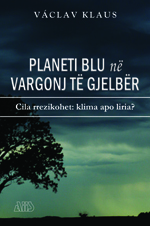 Planeti blu në vargonj të gjelbër: Cila rrezikohet, klima apo liria? The most eminent danger to freedom, democracy and market economy at the beginning of the XXI century is not socialism or communism. It is the ambitious, arrogant and unscrupulous ideology of environmentalism. This is what Vaclav Klaus, President of the Czech Republic, writes in his book, arguing that the environmental movement has been transformed into an ideology that aims to limit human activities and that proposed policies against global warming are economically harmful, especially for weak states.